I recently received a couple of books that I’ll be reading and posting more about what I learn from them. The first is Bringing Nature Home by Douglas W. Tallamy. 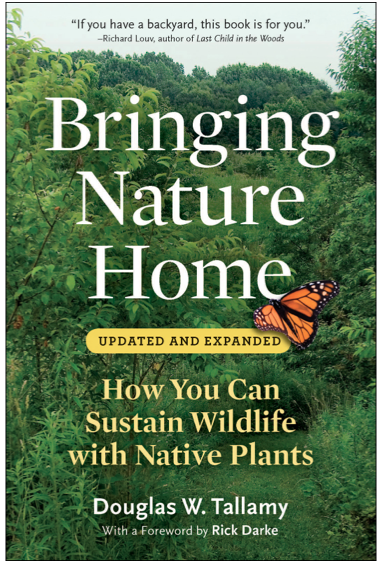 The author writes about the benefits of native gardening and provides tips and suggestions on how to plant and maintain native plant species. 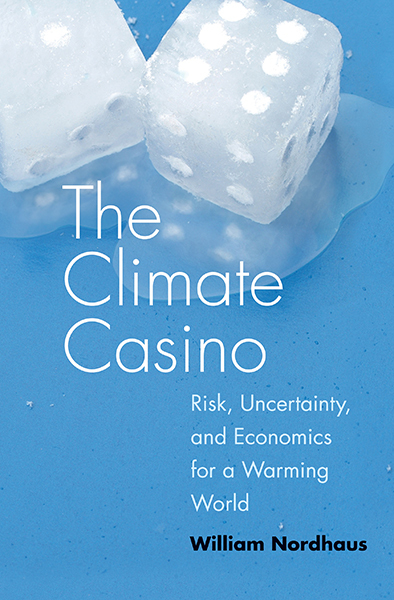 The second book is William D. Nordhaus’s The Climate Casino: Risk, Uncertainty, and Economics for a Warming World. Nordhaus looks at climate change from an economic perspective. This entry was posted in Uncategorized and tagged Cost of Carbon, Energy, Renewable Energy. Baltimore’s NPR station, WYPR, broadcasts weekly reports on stories, often ecologically focused, on Maryland and the Chesapeake Bay. The segments,’The Environment in Focus,’ air on Wednesday mornings and afternoons. The full archive can be found online at the link below. I’m going through some of the broadcasts now and they’re pretty interesting. Go listen! Plug for my alma mater today: Dickinson College chemistry professor Amy Witter and her associates found a new source of pollution in the South-Central PA stream Conodoguinet Creek, a tributary of the Susquehanna River. The Susquehanna is a major tributary of the Chesapeake Bay, and provides over half of the Bay’s freshwater. Pollution that enters the Susquehanna eventually finds its way to the Bay. Witter’s research found that the coal-tar-based sealcoat commonly used in residential driveways is having an impact on stream health in South-Central PA. This type of sealcoat is found throughout the East Coast and could be having impacts on other streams in the watershed. The good news is that this sealcoat is already banned in Washington D.C. as well as several other townships in the region. For those with journal access, the article was published in Environmental Pollution, Volume 185, pages 59-68. A summary of the findings can be found here: http://www.dickinson.edu/news-and-events/news/2013-14/Toxic-Driveways/. At the end of each year, the Chesapeake Bay Environmental Council meets to discuss future goals for the protection and restoration of the Bay. The Executive Council is made up of the governors of Maryland, Virginia and Pennsylvania, the mayor of D.C., the EPA administrator and the chairman of the Chesapeake Bay Commission. The meeting for 2013 took place last Thursday, December 12, in Washington, D.C. What occurred at the meeting? And what changes are in store for the Bay? Maryland Governor Martin O’Malley took over from D.C. Mayor Vincent Gray as head of the Council, a role O’Malley filled in 2007 and 2008. As chairman, he pledged to have a new watershed agreement signed by the council next year. The draft for this agreement will be available to the public in early 2014 (http://www.chesapeakebay.net/documents/21113/summary_new_chesapeake_bay_watershed_agreement_12_5_13_pdf.pdf), allowing for feedback and comment before its signing. Perhaps short term goals will hold states more accountable for recovery efforts in the Bay. Including the other states in the watershed will be an important change. I’m looking forward to reviewing the 2014 draft when it is released and will be sure to post more about it early next year. I am finishing up a grad course on Wetland Ecology and Policy. This week’s topic in class is on climate change and wetlands, looking at how sea level rise, and other climate change impacts will affect the hydrology of wetlands in the U.S. While doing some work for the course, I came across a report on sea level rise and the Chesapeake Bay. The piece is a couple years old- it was published by the USGS in 2011, but a very interesting read. The USGS study looked at estimated sea level rise, and used these predictions to create a simulation of changes in salinity in the York and Chickahominy River in the Bay watershed. The study found that salinity levels will rise with sea level, and change water quality gradients in saline and freshwater estuaries.